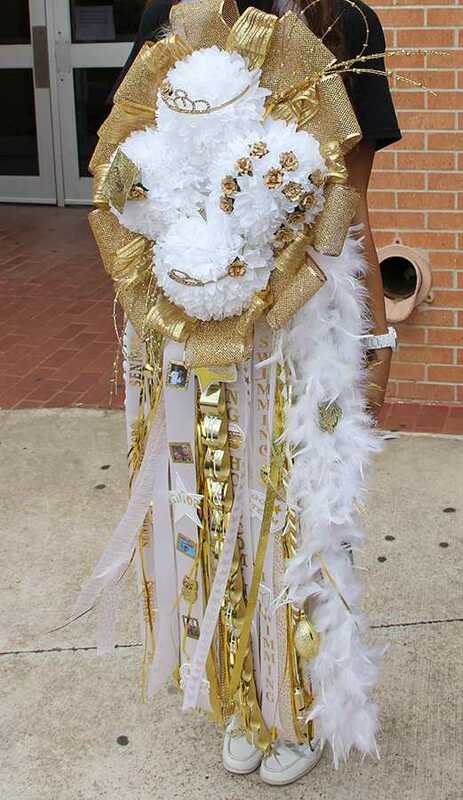 A student displays her oversized mum at last year’s homecoming carnival. As homecoming approaches and the aisles of craft stores fill with every possible variant of glitter, ribbon and adornment, students are reminded what making and giving mums really is: students competing to see who’s willing to spend the most money on themselves. While it began as the sweet and simple gift of a chrysanthemum from a boy to a girl before homecoming, the concept of mum making has now become a profound display of vanity in our generation, and reflects the egotistical atmosphere the media has created for Generation Y. While most students will say their efforts are strictly out of school spirit, the gaudy amount of knick-knacks, stuffed animals, and cowbells tied to ribbons and stuck on flowers in Texas proves to show the tradition of decorating mums has become more of a way to show off, and is detracting from what Denton High School stands for, especially on an occasion that honors the values and character of such a historical school. This homecoming, I encourage students to apply the upward of $50 they would be spending on over-priced ribbons and plastic, elsewhere, as this money would be much better put to use changing someone’s life than decorating a vessel of our own ignorance and pride. The week of October 6-10, Key Club will be providing all students with the opportunity to donate their mum money to Carry The Load, a charity whose aim is to support the families of soldiers who never got to come home after sacrificing their lives for our country. The student body has the opportunity to make an impact. If we start analyzing our choices, we have the chance to make an incredible statement about what students really value and for what THE Denton High School stands. Be an example of the word seen on many DHS football jerseys this season: SELFLESS. Keep your eyes, ears and heart open to this opportunity, and gain a renewed understanding of what a homecoming really means.